← Phil Makes the November 9! So two nights after Phil made the November 9, his backer , Erick took Phil and his friends (me included) to Jean Georges Steakhouse in Aria (a new beautiful hotel on the strip located in CityCenter). I was so honored that Phil invited me to this dinner, and i was EXCITED, cause this girl LOVES steak! My friends have gotten used to the idea that I blog, but they had yet to experience my “wait don’t eat that yet I need a picture for my blog”. So pretty much every course that came out I was snapping pics as soon as I could. Let me just say, this meal was AMAZING! We tried every appetizer (twice) and there were lots of cocktails, wine and beer flowing (this girl had a job interview the next day, so only one cocktail was had). The bread basket (after I grabbed one of the pretzel pieces and Katie grabbed one of the regular pieces). It was so yummmyyyy. 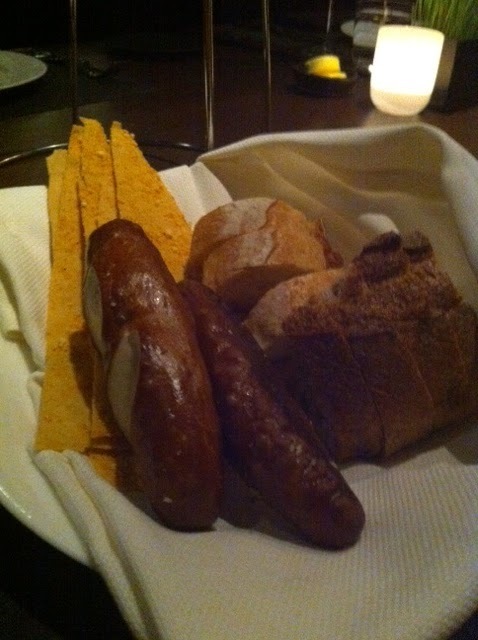 I love bread soo soo much and the pretzel was a nice start to the dinner. 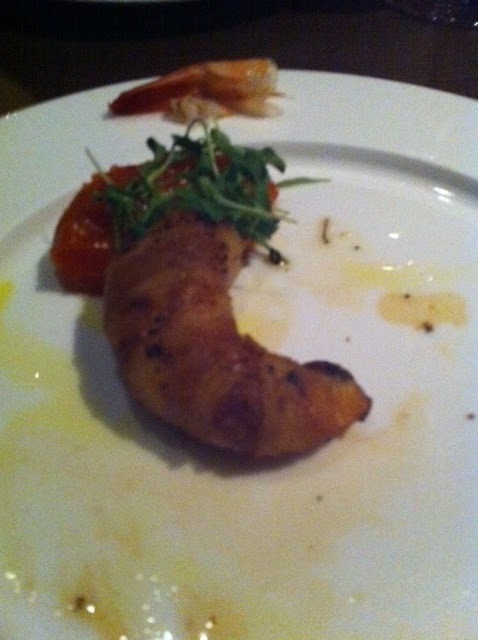 This is what was left of the crispy shrimp by the time I got a picture of it. Katie and I split one since we had a large group and large entrees coming. So delicious and that sauce was great. The last bacon wrapped shrimp, I may have had 1.5, since I shared one with Katie. These were the only apps I was able to get pictures of. 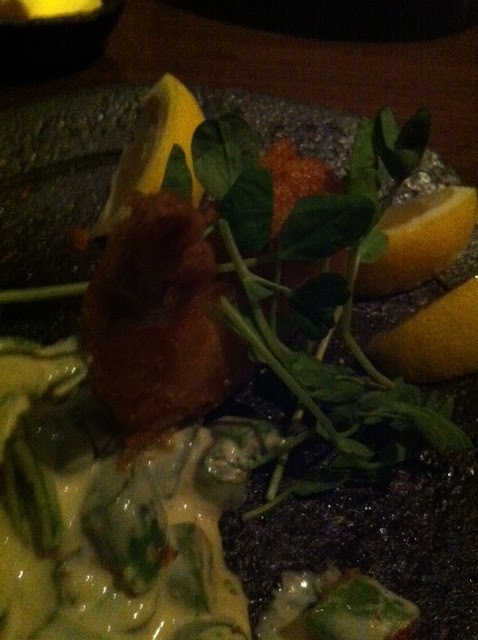 The sweetbreads were soo soo good, I’d never tried them before and still don’t know what was in it, but I enjoyed them. We also had fried calamari (delicious), crab cakes (which never made it to me, so they must of been good) and huge cold seafood platters (which had crab legs, lobster, oysters and shrimp). 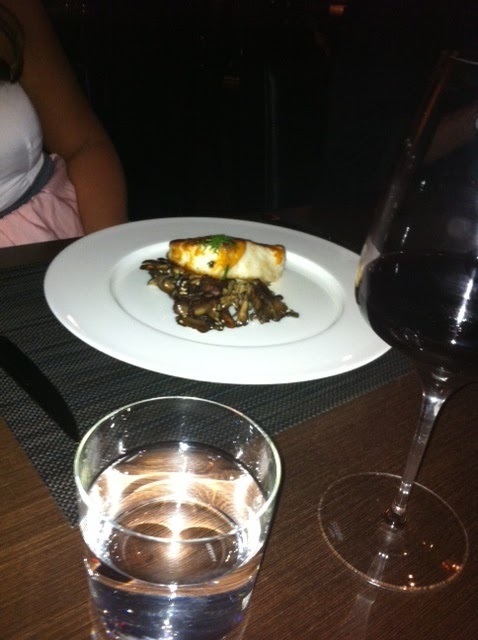 Ashley is ducking out of this picture of her sea bass. It looked delicious, but I forgot to ask her how it was. 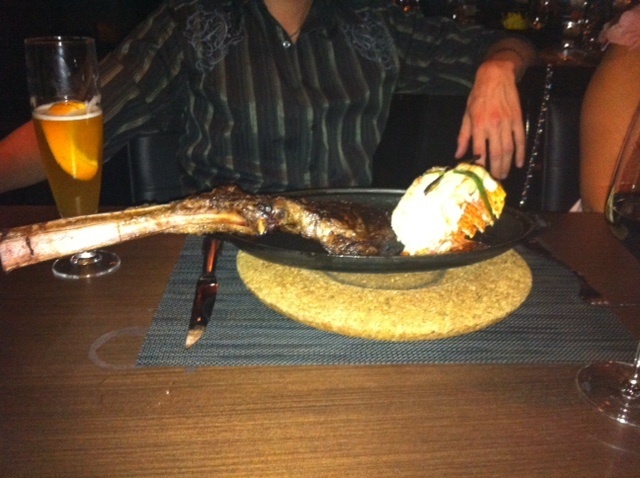 Brent (and most of the guys) had the tomahawk chop, bone in rib eye, with a poached lobster tail (that piece of meat was HUGE). Brent also wanted to make sure his blue moon was in this picture (I obliged since he waited to eat for me to take this pic, although I did chop his head off). 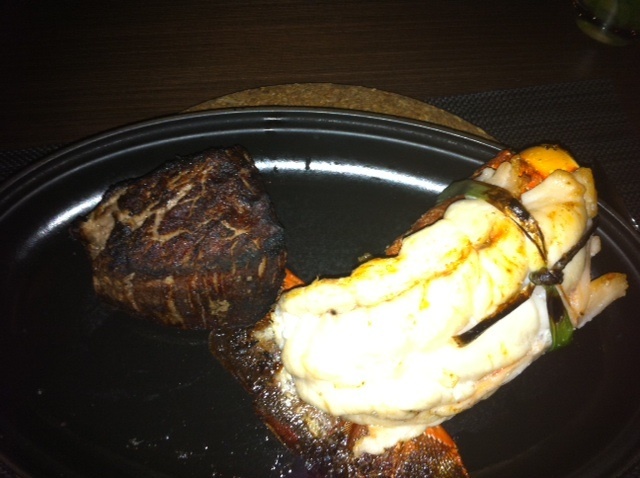 My filet mignon and lobster tail. OMG SOOO SOOO GOOD! The filet was perfectly cooked. I love when it has the beautiful center with a lil crunch on the outside. The lobster was cooked perfectly and the butter provided on the side was the only thing I added to the lobster. I ate as much as I could and ate the whole steak and half of the lobster (I’m more of a turf girl, than surf). These are the sauces that came with the steak. The bright yellow sauce was a hot habanero sauce ( I didn’t try it), the caramel color sauce was a soy miso butter (OMG yummy! 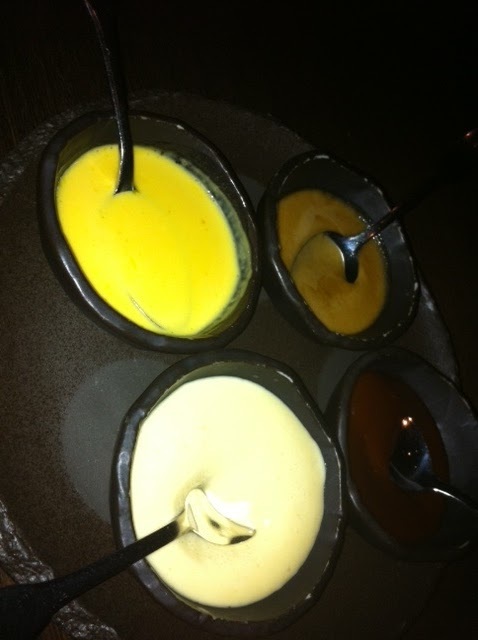 ), the cream colored sauce is a béarnaise sauce (Katie said she could of eaten all the bearnaise sauce in the whole restaurant, and I agreed, it was very very good! ), and the brown sauce is their house steak sauce (I didn’t try it). 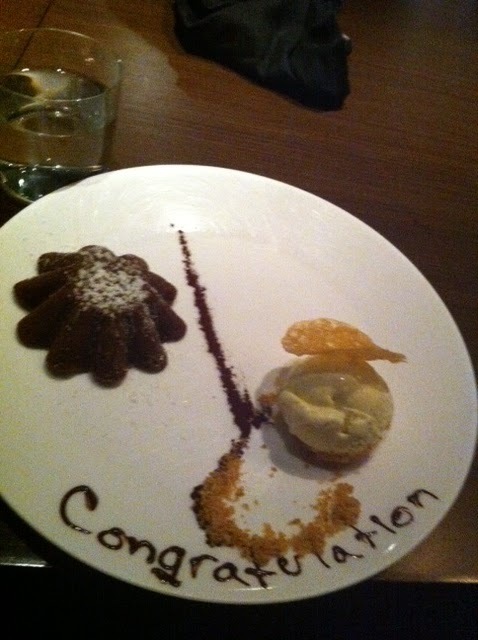 They gave Phil and Erick congrats dessert played (it bother Katie and I that there wasn’t a S on the end). I tried the chocolate cake, it was pretty good. Me out front after dinner. Trying to cover my food baby with my purse. 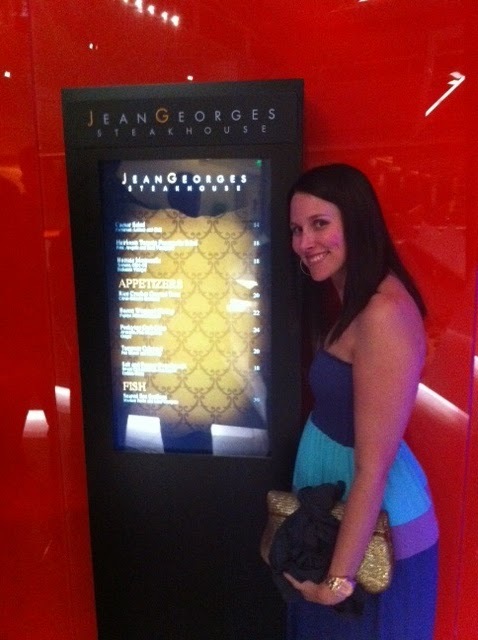 It was a great meal, if you’re ever in Vegas you should check out Jean Georges Steakhouse at Aria.